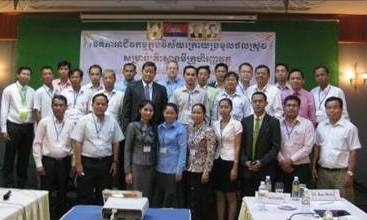 Thirty-one participants came, representing 9 microfinance institutions (MFIs), Asian Development Bank; Cambodia Agricultural Value Chain Program; IDE; HARVEST; provincial departments of agriculture; Cambodia’s Ministry of Agriculture, Forestry, and Fisheries (MAFF); Departments of Agricultural Extension and Agricultural Machinery; private sector rice processors; IRRI; and the local project team. The event was opened by Meas Pyseth, coordinator, IRRI Postharvest Project; Bun Mony, CEO of SATHAPANA, one of Cambodia's leading MFIs; and Alfred Schmidley, IRRI business model specialist. Dr. Pyseth, in his welcome remarks, highlighted project achievements and technologies now available to farmers and other chain actors that reduce physical losses, improve quality, and allow value-adding throughout the chain. These technologies include combine harvesters, mechanical dryers, and hermetic storage options that have been tested and studied in a business model context for sustainability and improving incomes of farmer and other rural actors.